Well, I’ll try to squeeze in a few more posts between now and the season two premiere, but damn that’s coming on fast, isn’t it? Not that I’m complaining though, I’m very read to hit “play” at this point. 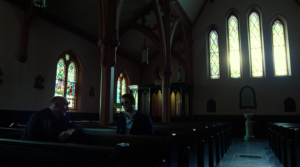 For this brief look back at season one, I wanted to discuss one of its primary emotions: guilt. And, I’m not just talking about Matt’s guilt. His is out there for all to see, and while not exactly a poster boy for mental health, he at least talks about his feelings with Father Lantom. 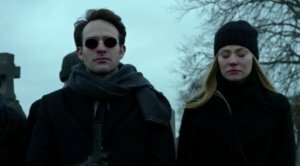 As mentioned by Charlie Cox, Matt even finds himself in a pretty good place emotionally at the beginning of season two (though that likely won’t last for very long). When I think about the feelings of guilt in season one, Foggy naturally comes to mind as well. At the top of the list, though, I would put Karen. Her story begins with her co-worker ending up dead just for speaking to her. 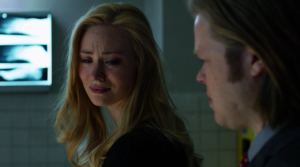 It obviously wasn’t her fault, but her fear that she might be a danger to Matt and Foggy is completely understandable. And, visiting the dead man’s widow is probably not a walk in the park either. When Elena dies, it’s Foggy who feels most of the guilt for giving her legal advice that may have put her in greater danger, but Karen obviously feels it too. After that, there’s her killing Wesley, and the death of Ben Urich. In Ben’s case, she knows that she tricked him into the situation that ended up with him being found out, and being comforted by Doris Urich is like asking to feel even worse. One of the things that fascinate me about Karen’s journey is that I don’t know how I would ever forgive myself for something like the situation with Ben. The other stuff, fine, but Ben really was tricked into something very dangerous and she had no right not to include him in what he was planning. I guess people really do move on from things like that, but I’m personally the type of person who beats myself up over minor stuff and would probably feel morally compelled to never let myself feel joy ever again. I’m not saying that’s healthy or reasonable, but I do look at Karen toward the end of the season and shudder. Not because I’m judging her, but because I find her predicament to be an absolute nightmare. I have similar feelings about the comic book version of Daredevil. The problem with so many years of comic book history is that you’re also dealing with as many years of misery; of personal defeat and loss. If you’re a superhero, much of it will be on you. Aside from lending the entire genre an extra layer of intrigue, that’s the primary reason for the secret identity. Even though you may up saving a lot of people, any person who can be connected to you is going to be in danger. 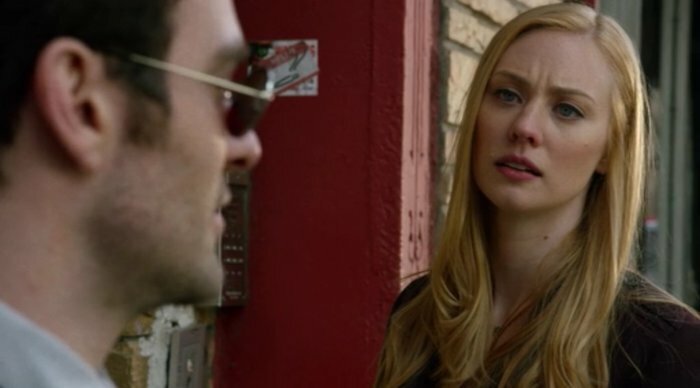 In the Daredevil show, we see that when Claire is attacked. In the comics, it’s a long trail of dead girlfriends. How do you really get over something like that? Karen does seem willing to turn over a new leaf though, which I guess is one of the interpretations of that enigmatic scene at the end of the last episode (see above). When Matt reaches out his hand, she gets that weird look on her face that makes you wonder: Does she know about Matt? Is there something in that moment that just clicks for her? Or, is this the moment that she makes an active decision to forgive herself and do as Matt asks her, to move forward? I’m looking forward to seeing what happens with Karen this coming season, and to discover what kinds of secrets – and past guilt – she is hiding. I sincerely hope that the creators don’t kill her off though. We had people who are still alive in the comics die last season so nobody seems to feel bound by established continuity in this regard, and it honestly feels like such a cliché to go down that path. I’m sure Matt will have plenty of other things to feel guilty about. Okay, maybe not Christmas, but if you’re a Daredevil fan, the release of season two in just a few hours is pretty much the same thing. Karen was the only one who didn’t get to talk out her feelings about killing Wesley. (Matt had Fr. Lantom, Foggy had Karen.) It was always disguised as distress about Ben and/or Elena. I wonder if that is going to affect her actions this season. I also wonder about whether Matt will reject her when he finds out. Oh, I would be very surprised if Matt would reject her if he finds out. He doesn’t have a whole lot of moral high ground here, and he also seems pretty typical of the kind of person who is harder on himself than he is on other people. True, but I could see him pressuring her into turning herself in though. Why would he pressure her to turn herself in? Killing Wesley looked a lot like self-defense to me, and if Matt was acting as her lawyer that’s surely what he would argue on her behalf. It’s not like Matt has ever turned himself in for his actions towards bad guys. Matt would blame himself some way for Karen having to kill Wesley. He certainly wouldn’t try to make her turn herself in. My biggest wish in the series going forward is that they don’t ever kill Karen. She’s already more complex than she ever was in the comics. The way I’ve seen some fans talk, to them Karen is already dead along with Elektra too. To them its just inevitable that Bullseye will show up at some point and kill them, because thats what happened in the comics so it has to be that way. I’ve never been able to understand this way of thinking. Why would anyone want the exact story you’ve already seen? This won’t make me popular, but if they have to kill off a main cast member at some point, it should be Foggy. It would totally break both Matt and Karen, and then they can find their way back to the light together.